Andrew Charlton’s Dragon’s Tail | Me fail? I fly! As with every Quarterly Essay, I turned first to the back of this issue for correspondence on the previous one, Paul Toohey’s essay on asylum seekers, That Sinking Feeling (which I blogged about here). The correspondence is excellent, with contributions from asylum seeker advocates (a lawyer, the caseworker and adviser who was responsible for the TV show Go Back to Where You Came From, a Jesuit detention centre chaplain), a journalist and – the one I was particularly struck by – Neil James, executive director of the Australian Defence Association. I just looked up the Australian Defence Association, and see from their recent tweets that their military-focused point of view may be impervious to evidence on at least some issues, but here James puts his case in a way that invites reasoned debate rather than the flinging of books across rooms. As Toohey remarks in his ‘Response to Correspondence’, the discussion manages ‘a rare achievement in this particular debate: that those who took issue did so without hostility’. Partly this is because for once party politics is laid aside. That Rudd and Gillard stuffed up seems to be generally agreed, but no voice is raised in defence of Tony Abbott and Scott Morrison’s opportunistic and hypocritical cruelty. is perhaps the most significant economic event since the Industrial Revolution that transformed Britain in the eighteenth century and laid the framework for the modern world. And China’s industrialisation has occurred 100 times more quickly and on a scale 1000 times larger than Britain’s Industrial Revolution. The essay ranges back in time, travels to many parts of the globe, draws the connections between a café owner in Cairns and global economic abstractions. I look forward to the correspondence on this one, hoping we won’t be treated to someone dismissing it as Labor Party propaganda because a) Charlton used to work for Kevin Rudd, and b) it doesn’t praise the brilliance of John Howard (the Australian Spectator has indeed published such a piece). Our national debates are frequently partisan and parochial. For example, if you are on the right, you know that the budget is now in deficit because Labor wasted money; if you are on the left, you know that a deficit was necessary to save hundreds of thousands of jobs. On the right, you know that Australian manufacturing jobs are disappearing because we are uncompetitive with our Asian neighbours; on the left, it’s because Australian industry doesn’t receive the same subsidies that those of other countries enjoy. On the left, you would argue that the global financial crisis was caused by greed and lax regulation of financial markets; on the right, you might point the finger at excessive government debt. 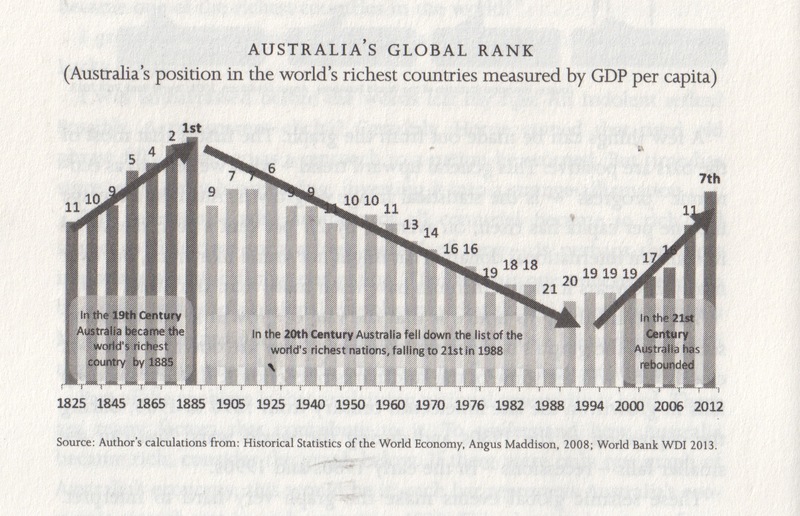 If you are on the right, you know that Australia pulled through the financial crisis because John Howard left Australia with a strong surplus; on the left, it was because of Kevin Rudd’s economic stimulus. On the right, you know that productivity growth is low because powerful unions disrupt workplace efficiency; on the left, it is because Australia hasn’t invested sufficiently in skills and infrastructure. These positions are easily digestible and often self-serving, but they are all either wholly wrong or drastically incomplete because they overlook the events beyond our borders that have shaped us. Charlton’s account of the global financial crisis refreshingly avoids the other pitfall of writing about these matters: he doesn’t go into the technicalities of dodgy financial instruments and manoeuvres, but sticks to the big picture, and as a result remains comprehensible. This entry was posted in Books and tagged Andrew Charlton, Neil James, Paul Toohey, Quarterly Essay. Bookmark the permalink.